Olores, colores y sabores. 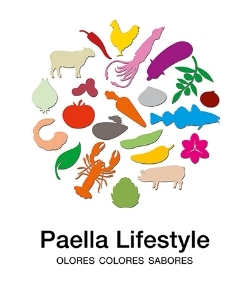 Paella Lifestyle is all about creating a healthy cultural experience and making people happy with irresistible food. ¡Salud! Paella Lifestyle is a concept created in 2014 by Noelia Murias, a Basque Country native living in San Diego. 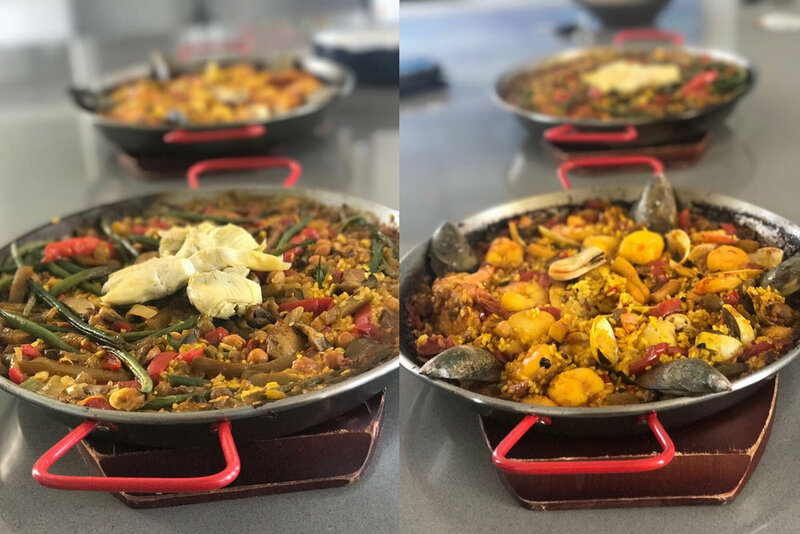 Its centerpiece is Spain’s iconic dish called paella, with the healthy building blocks of the Mediterranean diet and imaginative cuisine of the Basque Country. Organic ingredients from land and sea form a natural marriage of aromas, colors and flavors emerging from high-quality, seasonal products. Our menu is a kaleidoscope of tastes and textures for any occasion, featuring: Paella, the savory traditional Mediterranean rice dish with an abundance of subtle flavors; Pintxos, decadent food art designed with perfect pairings in small portions. Our unique, handcrafted paellas and pintxos come in all varieties: seafood, meat, vegan and vegetarian. An eye-opening combination of alluring aromas and palate pleasers! Handcrafted, made-to-order paellas and pintxos. Parties, special occasions, corporate events, company lunches, graduations, wedding receptions, celebrations. All of our paellas start with a base of fresh, seasonal vegetables and homemade broth. Each one is made to order with the ingredients of your choice. Simple and delicious paella made with free-range chicken, txistorra** and seasonal vegetables. Savory combination of organic meats (chicken, pork, beef and the star of this delicious dish: Spanish chorizo*). Vegetarian delight steeped with select garden vegetables and vegan products, such as: green onions, green beans, peppers, garbanzos, zucchini, artichokes, jackfruit, and mushrooms. Traditional plate of fishermen with peeled prawns, cuttlefish and fresh tomato with fish stock. Included Salsa Alioli. Savory selection of fresh mushrooms with vegetables and paprika. Organic mixed paella with chicken and seafood including jumbo shrimp, clams, mussels, scallops and Spanish chorizo*. Delicious black paella with the ingredients steeped in squid ink; includes fresh calamari and peeled shrimp. Included Salsa Alioli. A unique variation of paella featuring a special type of noodle called fideuà instead of rice. This delicious paella is made with fresh seafood and fish. Spectacular seafood paella with calamari, peeled shrimp, mussels, scallops and clams. Very special lobster paella with calamari, peeled shrimp, and fresh fish. Create your own explosion of flavors combining fresh, organic products à la carte. MEATS: chicken, rabbit, pork, beef, lamb, bacon and Spanish chorizo*. FISH: swordfish, cod, hake, monkfish, mullet, sea bass. SEAFOOD: squid, cuttlefish, shrimp, calamari, scallops, octopus, mussels, crab, clam, cockles. VEGETARIAN: green beans, zucchini, eggplant, tomato, spring onion, garlic, peas, beet, artichoke, mushrooms, chestnuts, beans, broccoli, tofu, etc. * Spanish chorizo is completely different from Mexican chorizo. It is an incredibly flavorful cured sausage with a rich red color and thick texture. ** Txistorra: special Basque chorizo, it is similar like Spanish chorizo. Our Tapas and Pintxos are based on seasonal ingredients. Please ask us for availability, more varieties and packs. Special prices for corporate events, weddings receptions and big groups. 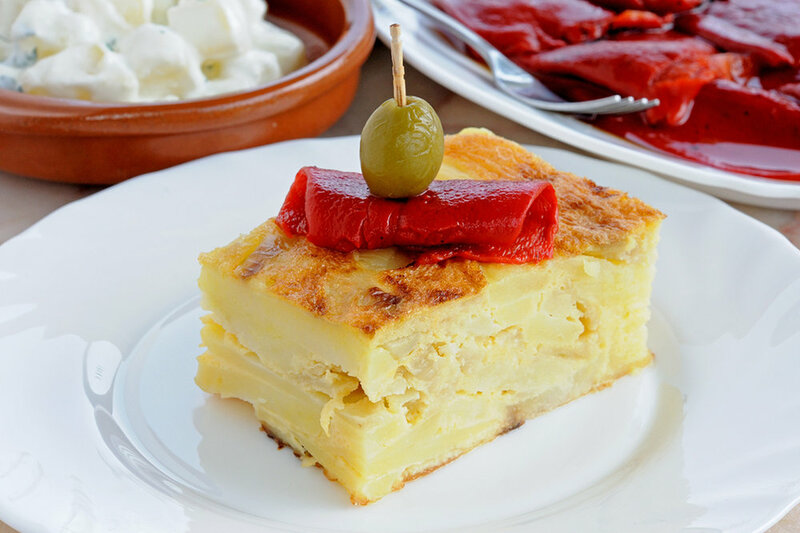 Irresistible Spanish omelet, made of potato slowly sautéed in olive oil with a combination of vegetables and eggs. Tasty omelette stuffed with spinach. Plate of fine Spanish cured ham, chorizo, and cheese. Toasted bread rubbed with garlic & tomato, with olive oil & cured Serrano ham. Spanish cold tomato soup with fresh vegetables and olive oil. Creamy cold soup with tomatoes, bread, olive oil, and seasonings. Delicious fried Padron peppers with coarse salt. Smoked salmon stuffed with crayfish and mayonnaise. Belgian endive, nuts, and creamy blue cheese sauce. Mille feuille with liver pâté, potato, kiwi, and plums. Sweet Piquillo peppers stuffed with a mixture of salt cod. Croquettes with codfish, chicken, bacon, txistorra, or spinach. Anchovies and Morrón peppers onto a garlic-rubbed bread. Juicy sautéed sirloin steak with Foie Gras. Spanish blood sausage stuffed with rice, onions, and spices. Button mushrooms to the Basque style. Available also version without cured ham for veggies. Fried Basque sausage with quail egg and pepper. Spanish potato salad with fresh vegetables and hard-boiled eggs with mayonnaise dressing. Tuna fish with mayonnaise and chili pepper from Ibarra, and anchovy. Spanish cream made of tomatoes, onions, courgettes, peppers and olive oil, with anchovies. Cold prawns with special vinaigrette sauce. Crusty bacon-wrapped dates or with goat cheese. Sweet quince paste with cheese. Fresh melon with cured Spanish ham. Longfin tuna in brine with salsa vinaigrette. Bite-sized delights on a toothpick with green olives, pepperoncinis, and anchovies. Paella Nigiris with prawns, scallops, beef, asparagus, etc. Delicious special roll stuffed with paella. Cold pink sauce with tomatoes and mayonnaise. Red or white wine, orange juice, Brandy, citrus and fresh fruit. We work with experts in Spanish wine, cava, French champagne and California wines provided by Gianni Buonomo Vintners. Noelia Murias: my passion for gastronomy comes from my homeland, the Basque Country. Since my childhood, family and friends have reunited together around tables to prepare succulent dishes in harmony with folk music. Since then my desire has been to enjoy these pleasures in the best company and in every corner of this world. Always linked to the management and development of new projects, Paella Lifestyle is a part of Farmer´s Market, Breweries, Wineries, private and corporate events with future projects in process with San Diego Chambers of Commerce. Come and reap the bliss of The Basque Country through its gastronomy. The Basque Country is a land of intense contrasts located between Spain & France, between mountains and sea, between traditional and modern life. With 5000 years of history and one of the most ancient dialects in Europe, it has a singular culture, unique sports like “the cesta punta” and “regatas de traineras”, a rich folklore with traditional music and dances, and its incomparable gastronomy with its “pintxos” (small tapas) lined bars and sidewalk terraces. The Basque gastronomy is considered one of the most prestigious, based on the quality of its products and in the good makings of its cooks. More than a sign of identity, it is a way of relating and socializing that we invite you to enjoy. Let´s go! *We are not in La Jolla Open Aire Market, the days with rain and strong wind.